This is the first post in a series that will revisit the basic elements of simple life. It's about how we live here but also about the possibilities, now and in the future, for you to live simply. This is written as much for my own sake as for yours because I find it useful to refocus on what I'm doing quite frequently, to decide if changes are needed, and to improve what I do. Life is never static. Let's start with the most basic - the name. Simple living isn't all that simple. In fact, when you give your whole life to it, it takes more time and effort because you tend to slow down, stop buying convenience and often home-produce a lot of the things you used to buy. So let's agree that the name doesn't mean much, it's just a way of us identifying a certain mindset and although we're all doing different things, we'll lump it all under the 'simple living' title for the sake of expedience and clarity. The next thing to agree on is that what Hanno and I do here at our home isn't the only way to simplify. We are older than most of you and now we no longer work for a living, we have the gift of time to do whatever we like. Many of our contemporaries are off enjoying their retirement travelling in caravans around Australia in search of the good life, freedom, satisfaction and enjoyment. Hanno and I found that right here at home. 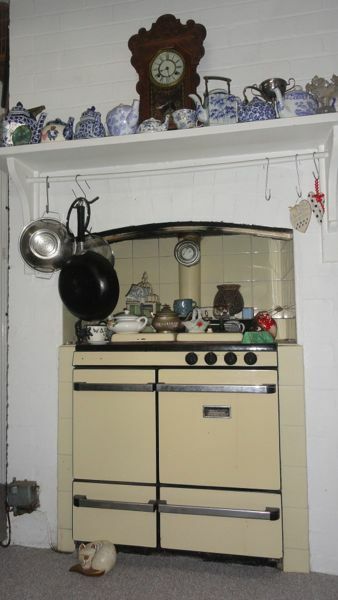 The two photos above are of my sister's kitchen and fuel stove. We built a stockpile, grow organic food in our backyard, have stopped buying anything that is not necessary, cook from scratch every day, use our leftovers, preserve our excesses from the garden, bake bread, cake and biscuits, shop locally and support our community, have cut back on electricity and water, mend, repair and keep up our house maintenance. We firmly believe that everything we have here are our assets and we work to keep everything in working order for as long as possible. We recycle and reuse. We value the work we do alone, and together, and we value each other. That is what WE do. It's not THE recipe for a simple life. There is no recipe and while there are a number of elements we all do, most of us pick and choose how we structure our simple lives according to age, children, work outside the home, income and ability. Simple life is always changing - there will be things you do now that you'll probably stop doing in the future; things that help you now that will become irrelevant. You'll change as your skill set grows, when the time you have in your home increases or decreases and when your passion and mindset start directing how you live. Everyone who decides to simplify in some way will do it differently. Age plays a big part in this. You will do different things depending on how much time you have and at what stage you're currently at. The trick is to not take on unnecessary debt at any stage so that you have to work to pay back debt instead of living your life. We'll talk about money and it's role in life later but let's just say now that most of us will take on debt in the form of a mortgage and it's important to pay that off as quickly as you can. So if you're wondering how to start living more simply, take some time to work out what your values are. Write a list and then depending on what is on your list, start with the most important part or the part that you can do right now - today. The other day, a younger lady asked how she could live more simply, given that she had young children and was working outside the home. I told her to start on making laundry liquid. It only takes five minutes to make ten litres, saves so much money and she would be using a lot of laundry liquid with the young children. What I have found is that when you try one new thing, it tends to lead you to the next thing and the next. So for this woman, she may make laundry liquid when she has time and when she sees it works so well, she might look into making other green cleaners. So for her, cleaning would be her starting point. You can start anywhere - by writing up a budget, menu planning, thinking about how you shop, creating a vegetable garden, buying chooks, making soap, organising your kitchen to better suit how you work, installing solar panels or water tanks/barrels. It could be anything. I started with grocery shopping. I needed to cut the cost of living in our home so I worked on that first. That lead me to stockpiling, baking, cooking from scratch everyday, preserving, freezing, chooks and the backyard. I started with one thing and it lead on to others. It will be different for all of us, we are a diverse group of differing ages, values, ambitions and capacities. So it doesn't matter what you do first, the important thing is to start. I'd love you to share how you started living a more simple life. What was the first thing you did and did that lead on to anything else? The first thing I did was begin to train myself to be content with where I lived and what I owned. I have now given up milking cows full time after many years of doing that. Dh took a new farm position so I could do that ( he is a darling). 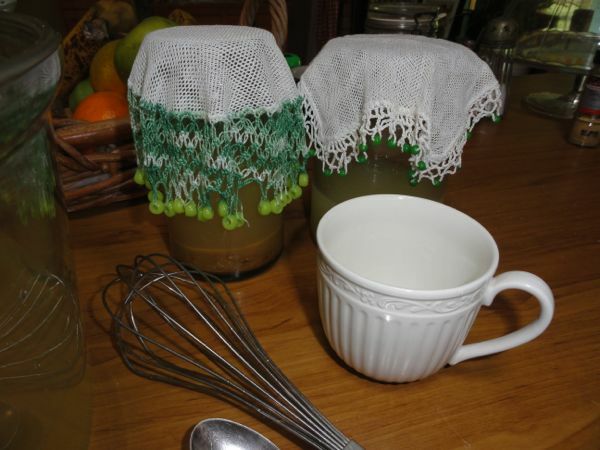 I have been simple living to a degree for quite a few years and now am at the stage of making my own cider vinegar/ corning my own beef/making knitted mittens and doing crafts to make our home more homely. I have many vegetable gardens/ fruit trees in tubs seeing we do not own the land where we live and I preserve. Simple living is a mindset. Dear Rhonda, I am delighted to have stumbled upon your blog this evening (yes I am still stuck on the 23rd ;) ) - many wonderful and inspirational articles! I will be sure to make regular stops here! I find it quite difficult to identify where I started. I was brought up with a mother who sewed and both of my parents mended and repaired everything possible. I never really lost that and have always sewed clothes and taken care of what we own. We have invested in solar hot water systems in several houses in which we have lived. Harvesting water was second nature when we lived in country South Australia in a relatively low-rainfall area. Now we do not have town water and are completely reliant on rainwater, however, we are in a high-rainfall area so that is not a problem. However, the first change that I consciously made was with shopping. Almost 25 years ago I met a couple who were absolutely passionate about reduce/reuse/recycle. This led me to re-examine my shopping habits and to seek out items with minimal or recyclable packaging. I refused store carry bags, took my own containers to be refilled and was often looked at as a curiosity by staff in the shops. I continue these practices as well as growing some of our own fruit and vegetables and many other activities which fall into the category of simple living. This has all been done while raising 2 children who are now independent adults as well as paid work. I worked part-time for a number of years then full-time and continue to do so until the mortgage is fully paid. It's early days yet, but I think I would like to start by reducing the amount of packaging and waste we produce at home. A recent strike by the refuse collectors has made me more aware of the amount of rubbish we all throw away. Living in a flat without a balcony or garden it's not really possible to compost stuff, unfortunately, but I will think more carefully about food packaging and unnecessary plastic bags and aim to use more re-useable items. One of the first things I did when I started this simple journey was to clean out and organise my pantry! Seems like such a simple thing, but it isn't just the heart of the home it's the aorta!! Without it there is no heart! Pull everything out...clean it...put everything back in logical order (for you)... throw out what is old and out of date... and spend the next week making meals from all those packets and "things" you swore you were going to use, and haven't. Get that in order, and keep it that way, and everything flows much more smoothly. That is something I always tell myself I should do - make meals from what's in the pantry until it's all used up! I start on it, but then forget and it builds up again. Have you ever tried the $21 challenge? It's basically a challenge where you get only $21 to feed your family for a week and the rest has to come from your pantry & freezer. Since the challenge was designed for a family of 4 and I live alone, I did it for a month. I sure missed fresh produce, but was AMAZED by how much food I had on hand! I would say the journey started with having to budget due to my husband having to change his job before it ended, he had to take a huge drop in salary, so i started looking at blogs, found yours, so i learnt to menu plan, food budget, cooking from scratch, i am just starting to organise the kitchen for stockpiling, and we are growing, each year expanding on the growing, fruit and veg. We have always been careful with money and budgeting and keeping in budget are the cornerstones of how it all works, we use cash for housekeeping and the envelope system for each week, i make all our woolly jumpers, and have made clothes for myself, we use charity shops. My husband has always mended things and built things. Life does slow down and i feel it has better quailty in it. I accepted a job that I love. It pays about 1/3 my previous position and I am so much happier.I grew up in a frugal home so I just expanded on those ways. I am very conscious of our utilities and insurances. I am always looking for ways to do better. I no longer watch TV and I love free concerts. My outdoor lights are now solar and I have ceiling fans to assist with heating and cooling the house. I drive a used car with minimal insurance and while I have excellent health insurance (hubby's job) I work at keeping myself healthy I enjoy recycling and up-cycling. Due to hours of pleasure reading,I have a million ideas stored in my head that I pull from. I get more pleasure from a cup a tea on the deck or porch than shopping at the stores. I could live much simpler but my hubby and I compromise, maybe, one day I will have him 110% on board. For me it was when I had children and became a stay at home mum, 27 years ago. I had to stick to a tight budget and I learnt to cook from scratch, sew and became 100% content in my role. That's important...to learn to be content in what you do and with what you have. I went back into casual work when the kids were 11 & 9 but still cooked from scratch. Now in the last few years as I look towards retirement and budgeting the money for a different purpose I have added homemade cleaners, foods, soaps, cosmetics, veggie gardening to my repertoire! One of the most important factors you need to work towards is definitely getting rid of debt. We saved & budgeted hard years ago and cleared the mortgage. That is what helped us to live 'easier' now. But easier doesn't mean you give up 'simple'...it makes living 'simply' easier! Having both grown up with absentee Mothers, Hubby and I wanted our children to have a Mother at home, full time. First I developed a budget, then I quit my job, and then we bought a small farm. It was tough, we were hailed out the first year, right down to the last berry. But we paid cash, did with less, owned no TV, and made most all from scratch. Now we are nearing retirement, and like you planning for a simpler (not easier) life at home. Am back to baking bread, cooking more, downsizing everything. Next is developing a vegetable garden in our horrible soil - greasy when wet, rock hard when dry! Looking forward and Loving It! I grew up in a household where my mother was frugal: we had mainly op shop clothes, she cooked from scratch and there was no conspicuous consumption. Of course, I rebelled in my 20s and early 30s and wanted only new stuff and loved to shop - it was my favourite hobby! - but once my husband and I decided that we could afford for me to stay at home full-time and have children (therefore buying a small house, with a small mortgage) I started to question every aspect of our lives, and take things much more slowly. Being a naturally lazy person, I cut out anything that caused me to rush around, and managed to bring up 2 children who barely had any outside of school activities in primary school (ohhh, the freedom, AND the extra money available!) So I had time to make proper meals from scratch, spend time with my aged parents, learn to quilt, relearn to crochet, knit and mend, and keep a reasonably uncluttered house. It sounds easy when it's written down but it took years of practice and going against the flow of almost everyone around me. For me, time was the key; I wanted to savour it, and teach the children to enjoy the everyday moments. Now one is at high school and things are different: she wants to be involved in lots of things and life can be more fast-paced, but we all enjoy simple pleasures like a weekend walk on the beach, a Sunday roast, collecting eggs from our chooks (an everyday miracle if ever there was one!) and snuggling in bed together. Hi Rhonda I am going to need your wisdom and that of others here and on the forum. As of Wednesday we will become a single income family loosing over$400 a week. The decision was that of my husbands and mine due to the nature of my work. I have always lived by the Self sufficiency "dream" for want of a better word, We have 5 acres and the veg garden is 14 meters by 14 meters we still have the girls and all we need to live a good frugal life. Looking forward to this next chapter in our lives. We started with a couple of pots of herbs. When we sold our house we brought a house with a larger yard for a veggie patch, put in a water tank and solar panels. As a stay at home Mum I make as much as I can from scratch and enjoy knitting and sewing. Next up, chickens! My first step was to do a menu plan, just for a week. Then check pantry for what extra I need, then write a list and stick to it, except for super specials that come up. I then visited a wholesale butcher, bought meat in bulk bought it home and bagged it up and froze in meal size portions. This week I am doing two week menu plan. My second and what I found most important, was to have all my money into one online savings account pay weekly family assistance fortnightly and child support monthly, then have a transfer to my card account and seperate bills account each Friday. I then take out $200 for the week, this pays for food and petrol, and kids bits and peices. Bills account pays for bills. Some weeks like this week I have about $20.00 left on Monday, but I have a car full of petrol and two weeks worth of food in fridge and freezer. So I am rich compared to some. I have no credit card and a growing investment account, and a ever decreasing mortgage. I started out by moving away from Sydney, first to Glen Innes, and then to my present home in Armidale. This made my cost of living lower and allowed me to work less. At first I rented on acres, so next I put in a vegetable garden. There was no TV reception on the farm so I suddenly had all of this free time in the evenings. I used that time to repair things, write, and bake. Friends then showed me how to make sourdough bread. When the children came along I started making their clothes and some of their toys. Wanting to save money, I made my own change wipes, and all of our food was straight from our kitchen, much of it having been grown in our garden. But as you so wisely point out, life goes in different stages, and what we could do in one stage isn't always possible or appropriate in another. I tried to 'do it all' at a time when I was the only breadwinner - it was crazy, and I burnt out. So I gave myself permission not to replant the garden last Summer, and just concentrate on the fruit trees, cooking, basic maintenance. Now life has changed again. The love of my life is coming to live with us, and this means I can again work less, get back into the garden, and make a beautiful, warm,loving nest for my family. Looking forward to the next post on this wonderful topic. My life changed when I became a single parent, over 20 years ago to two children under two years old, in a small country town and the childcare involved a possible total travelling time of around 3.5 hours a day and the childcare and travel would cost me nearly my whole wage. I left work and went on the sole parents pension, this barely covered the mortgage and the monthly bills, but at least I was spending more time with my children and wasn't any more tired or broke than if I had tried the other alternative. 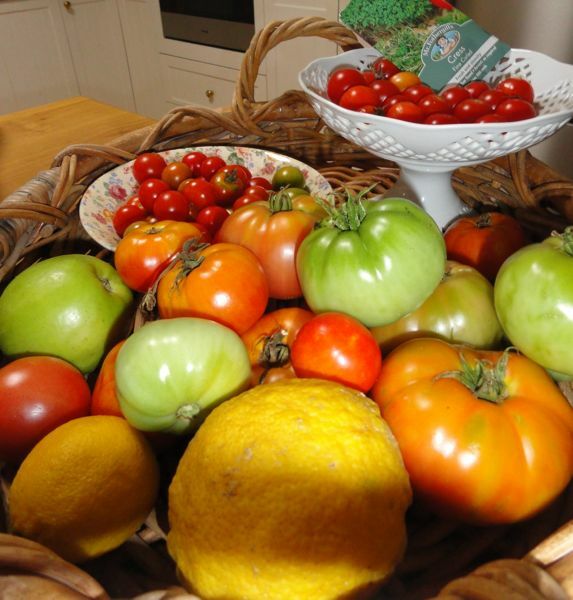 I bought bulk fruit and vegetables, cheap and in season, and cooked and preserved from scratch until I had my own vegetable garden productive. Op-shops were my favourite clothing stores... and still are. Later on I learnt to make laundry liquid and soap and I've always sewn but it's finding the time to do so when you have small children that is the problem. I did sew all their school uniforms until they were in high school as it was too expensive to buy them and the bought ones were always too short in shirt or dress length! It all paid off as my adult children know a bargain when they see one, pay cash whenever possible, can whip up a tasty, filling meal out of whatever is left in the kitchen at the end of the pay week and sew on a button or shorten their new jeans if necessary. I have been enjoying your blog (and commenting) for quite some time but I have a confession to make...I don't really think I can say that we live simply. My husband is a business owner and works long and hard hours. We live in a beautiful large new home and have all that we need and want. We also have a second home on a ski mountain. Our children are grown now and I know that my husband looks forward to retiring and relaxing, traveling and letting others "do the work." That said, I have always cooked from scratch, grown a garden, stockpiled, canned , frozen and preserved foods. I try not to waste food and am quite good at presenting leftovers when we have them as whole new meals. While our children were growing up we always had meat and egg laying chickens. Also, the men in the family hunt so we preserve and eat a lot of venison. It is my hope that I can continue to live the "homemade" life and perhaps share my knowledge and experience with daughter in laws if they are interested. I think your advise of starting out with something small like laundry liquid is a great place to start and then one small step leads to another when we find the time to fit it in and it snowballs from there. Another small step for anybody wanting to simplify is to really think hard about any new purchases. I have stopped myself countless times over the last year from buying a newer, shinier version of what we have or making do with the options available in my home. And if you really need something maybe purchasing second hand. It all adds up. I have been following your blog for a while now. It's such a happy place to visit! My problem with simplicity is that we live in an upscale part of town and my kids to kind of upscale school. The reason is that we live in the "murder capital of US" and this is the safest neighborhood. Moving is not an option at this point. While I would not care about what my neighbors think about me, it's different for the kids. The children in their classes travel abroad, wear brand clothing, and have the latest gadgets. My kids don't have most of those things. I could just tell them to not be shallow and not keep up with the Joneses but "the Joneses" are their friends. All kids want to be like their friends, to be equal. So how do you balance simplicity with fitting in? I don't think you do balance it. You either fit in or you don't. My kids went to an expensive boarding school with all the perks you wrote about but even though a lot of their friends had credit cards and could buy whatever they liked, many of them didn't. My kids had an average amount of pocket money and when that ran out, they didn't get it topped up. They made friends, some of those friends they still see today. They complained about it but I wasn't going to give them extra money to pretend we were wealthy when we weren't. Giving your kids extra money won't make them something they're not. It will be tough, but life is tough and we all have to learnt that at some point. But having said that, there are plenty of things you can do at home that will help you save money and resources. You don't have to advertise what you're doing. Just go about things quietly, hopefully you'll get the chance to explain to your children what you're doing and why. They might surprise you. Our journey to the simple life started with a plan, we had talked about living simpler for years, then it was thrust upon us - my hubby got laid off and my hours were cut. We are so lucky - he was on unemployment for a year and we knew he wasn't getting hired back, he was eligible for his retirement- had worked for 30 years, so we chucked the life we had in California, and moved back to my part of the country (Idaho). The 401k paid for the house and the pension pays the bills, we started a small business for the extras, planted the garden, and have the time to live the way we talked about for all those years! This is how I was raised - couldn't be happier - no debt - we have been truly blessed! Gosh... I think my first step was more like a giant leap. I was the quintessential over-achieving child - class valedictorian, Phi Beta Kappa, Suma Kum Laude, the whole nine yards. But my junior year in college, something inside of me just broke and I decided that I simply couldn't live the life that I was being groomed for. I hit a point where it was either change or die, so I basically decided that from that point forward my life belonged to me and no one else. I switched my major to music (I already had all the credits I needed in that department) and decided that I wanted to live out of my car, write songs and play the guitar on street corners. I ended up at a small folk music school full of one-time hippies where I learned to embrace the life of a societal drop out. I learned to live happily beneath the poverty level, and to make do with what I had. That was 25 years ago. There have been many twists and turns since, but my life has remained unconventional and wonderful! I think there's a certain advantage to starting young, I sort of skipped the steps of making lots of money, getting into lots of debt, and the subsequent struggle to escape from the rat race that most people have to suffer through. I suppose I have been taking steps towards a simpler life for some time.When my children were very young my husband and I chose to sell our larger home and downsize to a much smaller property in order reduce our mortgage and allow me to be a stay at home mum whilst they were preschoolers. As they have grown and time has allowed I have acquired more skills gradually, baking my own bread, knitting small items, growing a few vegetables.I now work part time and really need to focus on budgeting again so that the extra money I am earning goes into reducing our mortgage.It has been small steps along the way. Your blog has been a real inspiration and I am looking forward to reading the rest of these posts. I've always romanticized the life my grandmother lived. She lived a simple life, but she also had a quiet soul. She went about hanging her laundry, growing a garden, canning her produce and cooking from scratch because that was just life for her. I wanted that. I started with a small garden and increased it's size over the years. I've moved to edible landscape and making my own pasta, yogurt and soap. I have rain barrels and an underground cistern. Our home was built using passive-solar design. Now that I live and work on a ranch my lifestyle blends into daily life the way I envisioned it would. This life is gentle on the earth and that's important to me, but it's also gentle on my heart. I think mine was buying second-hand/thrifted clothing (and sewing my own). Plus more cooking from scratch. No disposable menstrual pads. No shampoo. I'm not sure what came first, but I do believe the thrifted clothing was it: I stick to it, because it's cheaper, it seems more ethical to me, it's easier for me to find styles I really like (with changing fashions, now more in the realm of "totally not my style"), and it's kind of a hunt, more fun. The money part is important, not just because I can dress myself cheaper on average, but because this way I actually can buy more quality things I would not be able to afford otherwise! I am finally starting to "get it" and am beginning to live simply by doing a major declutter of our home. I nearly weep at the amount of stuff I am getting rid of (op shops etc) as we have paid for at least 90% of it - what a waste - and I am constantly exhausted working night shifts. I think of the work that I needn't have done if I had just been a bit more thoughtful about spending. I started saying: 'I can do that' and 'I can make that'. Kids know the difference. Mine are envied by their peers. My kids know that they are special. And that makes me happy. That they know that they are loved so much. My kids started by watching me. They are now 12 and 15. I under-estimated how much they were absorbing. I see them understanding the value of the dollar and the invaluable gift of pride at being able to create something with their own 2 hands. I see them learning and practicing self-sufficient ways. Making gifts, baking, cooking, planting, budgeting, being green-minded. And that makes me happy. That they are growing into fine responsible and wise adults. That I have unwittingly given them a gift to last them a lifetime. The power of 'I can'. I love your comment, Vicki. Such wise words on the value of modelling behaviour to children. I recently got married and we're working towards a deposit for a home loan. So I've started to cook more, just a few nights at a time. Then I started to really enjoy cooking and now I cook every night! I also buy things in bulk, freeze and stockpile. We're also hoping to purchase a house that's a little cheaper on a bigger bit of land so we can grow a few veggies etc. I've cut down on the chemicals I use to clean the house and have switched to green cleaners (the really easy ones from Rhonda's book). Then I thought I'd step it up a notch and made my own laundry liquid. Now I'm going to attempt making soap! We look for good quality furniture from secondhand stores or through gumtree, for example our current gas heater - which is only a year old - would have cost us $799 brand new, but we bought it for $350. For me its about doing small things that I can manage and committing to it. Once I get used to it / start enjoying it I'll attempt the next level and so on. So far its been a great journey! Hello all, I've been reading here for a good while now, but this is my first time commenting. I am a single gal living in the city with my pets. Renting, of course, and paying an arm and a leg to do so. I have no place to plant a garden, but I do grow herbs in pots and go to the farmer's market to get produce and eggs (most of the time). I am so fascinated by this topic because I am just starting my simple life. I realized not long ago that I hate working all the time. It's so hard when you are single and kind of young (34 anyways) and have nobody to help share the load. But, I am trying to figure out how to work less, even if I make less, and still be able to provide for myself. Like I said, I have herbs in pots and I guess that is my start. Next up, I plan to make laundry liquid when the stuff I have runs out. And shop less!!!! I want to waste less packaging and food. Recently I've worked really hard to not waste food. I will be reading as you go through this series to pick up more tricks of the trade and I have to thank you so much for sharing. I read this blog because although I live far away from my family and home I feel like I a at home when I read what you have to say. Thank you for that little comfort! Thank you so much for the wonderful post. We started with keeping an herb garden (something my mother always did, because we love to cook with fresh herbs). When we were expecting our first child I transitioned to freelance work instead of editing in-house so I could stay home with our kids. I started making and canning our strawberry jam in season because we live in strawberry country and it seemed a shame to buy it. I learned to knit. Each thing has been something we could build upon. We recently moved out of deed restrictions. We just had a big canning session a couple weeks ago after our neighbor let us glean his tomato field. And a few days ago we got our first chickens. Did I think, back when I was working full-time and tending a few herb plants, that this was where we'd wind up? Nope. But I'm loving it, and we will continue to go down this path, a step at a time. It started 8 years ago when I came home full-time from my career as a nurse. It was an adjustment but little by little I made changes. Then 6 years ago we moved to the Pacific Northwest and the "green" around us and meeting people from Portland,Oregon (who many tend to live sustainably) influenced me. 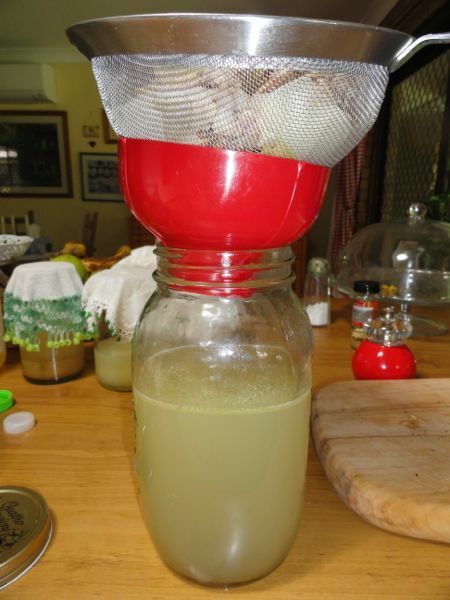 I started making my own cleaning solutions, then cooking more, on and on. Still trying to make more simple choices. The word aone inspires me. Thanks for blogs such as yours that make me feel not alone in this venture! I suppose I first learned how to make do and mend from my Mother. She knitted ,sewed ,grew vegies had chickens and when plastic bags came in she washed them and hung them on the line and reused them again and again. She knitted all her shopping bags from cotton . She turned collars and cuffs on my dad's shirts ,oh the list is endless. so when I got married 52 years ago I knew how to make a pot of soup and how to live a simple life. I make everything from scratch, I also do the $21. challenge from simple Savings Secrets...I have been a member for many years. We have 1/2 an acre of land have fruit trees(Apple x 3 Pear x 2 ,1 Apricot,2 Lemon trees and 4 Hazelnut trees but so far no nuts . We have bushes including blackcurrant, redcurrant, gooseberry raspberry and strawberry. We grow all our leeks and garlic for the year. We have pumpkins (10) which will do for soups and scones . Our local Health Food Shop sells honey all I have to do is take a container. We have chicken's for eggs. We have a friend who killed a steer and we bought 2/10ths which gave us 7.5kg mince and 60 sausages as well as all the other cuts of meat, it worked out at $5. kg . All bills are paid fortnightly so I never get nasty surprises and we are always in credit . I make all my laundry liquid and Spray and Wipe. Jams ,relishes sauce too. Not bad for an old chook. I just found your site and already feel a connection to everyone. My husband and I are now retired with a good retirement thanks to his thrifty ways starting many years ago when we had nothing. First, he make extra payments on our mortgage and paid off our home in about 15 years. Then as he was getting raises at work, we never saw the money. It was taken out of his paycheck and went directly to our saving account. Out of sight, out of mind. We bought newer secondhand cars, paying cash. Again saving thousands in interest payments. I think people would faint if they added up just their interest payments for homes and fancy cars. We didn't move up to a bigger or fancier home like all of our friends. Yes, there were times when I wished I had a brand new home or some new toy like my friends. But my husband and I would discuss just how much we wanted to spend the money...usually the answer was, "No." Therefore, I was able to work part-time and take part in our kids activities and helping with our elderly parents. For vacations, we saved and paid cash for everything. When something was very important, we bought it when the stores offered interest free for a year. That is how I got stoves, washers, and such. Even now, we have one credit card and never pay interest because we pay it off entirely each month. This helps us see where our money is going, such as gas or groceries....or Amazon.com. Yes, I do have an addiction to that site. Since retirement, I first started making my own washing powder and just stopped buying silly cleaning products. Almost everything can be cleaned with vinegar or baking soda. I started making jams and jellies and pickles. Today, I buy in bulk when possible and have learned how to store food for both short term and long term. I am working on having a year's supply of foods and health items. I have started a garden with mixed results but will keep trying. I no longer want new clothes or big trips. I have found a peace just being in my home and with family. I take great pride in learning the old ways of doing things. My husband and I have our home prepared for the next hurricane that will surely come from the Gulf of Mexico. Perhaps I should get out more, I find myself at parties bragging about my dehydrated foods and produce from my garden. Most people look at me like I am crazy, but there is always two or three that pull me aside and we have long conversations and share ideas for a calmer more prepared life. I think our lifestyle might be the newest fad, more and more people are recycling, making do, not buying just because something is shiny and new. I know I was exhausted from living such a fast life and now it is wonderful on some days to stay in my pj's all day and cook or work on a new project. 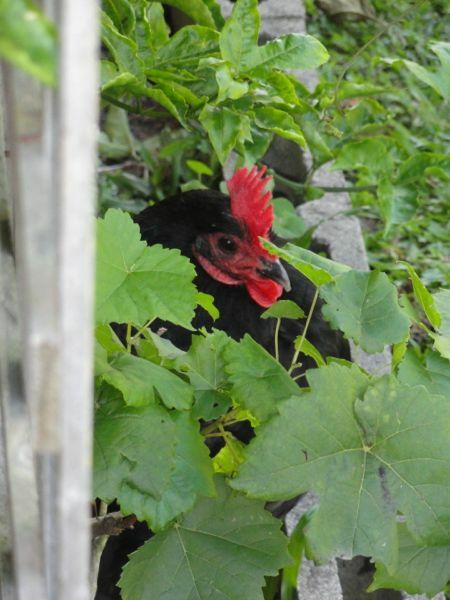 I hope to have chickens in my backyard someday. Looking forward to reading all of the information on your site. Our simple life started with a small - door sized - vegetable patch in the back garden. As I started to use the produce we grew, I started cooking from scratch more and more. A move to the country a few years later had us expanding our home growing, our children participating too. I started foraging and picking local farm produce. I learned to make jams and chutneys and really got stuck into my recipe book collection. We were very isolated and the winters cold, so I used my cosy indoor time to learn how to crochet. My daughter learned alongside me. 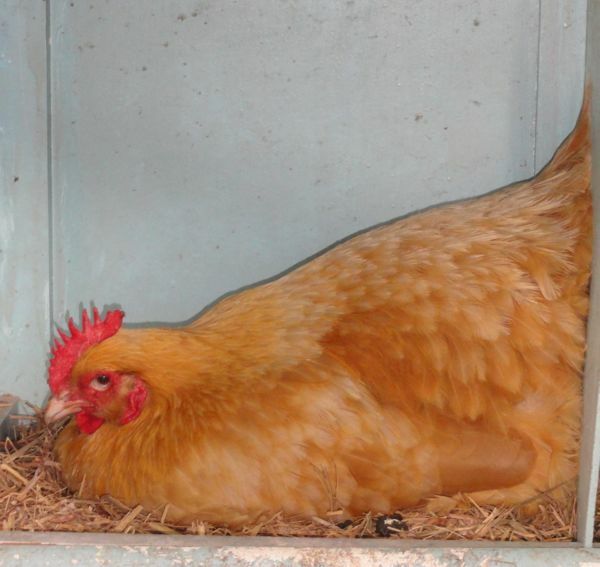 Then we got a few hens. My farm friend supplied us with milk and taught me butter and yoghurt making. I learned to make ice-cream too. My children learned some woodwork, each making their own beds. A move to a bigger house, and we bought a cow. I learned cheese-making and started sewing again. I expanded our vegetable patch into a tunnel that sees to most of our vegetable needs all year round. We now have a lamb that we are raising for meat, two milk cows, a heifer and another calf on the way, two horses and 11 chickens. My husband keeps bees. We sell our honey, preserves and cheeses at the local farmers' markets. It feels as if we are living in the land of milk and honey. Simple Living is hard work, but intensely rewarding. If I had to start with all the responsibilities that I have now, I doubt I would have coped. Growing into simple living is a slow, often tough process, but worth the journey. It started with my food/diet. Five years ago when we started trying to have a baby I stopped and looked at what foods we were eating. Some of the stuff in the pantry couldn't even really be considered food. From there it grew, along with my edible gardens. To this year I made a deal with myself, if I wanted another year off work that I was not going to buy anything new this year for myself. I have always hated shopping, so this was easy. 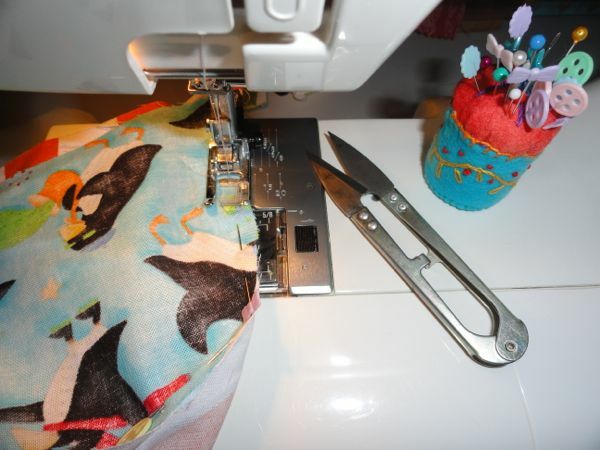 If I want new clothes I have to sew from my fabric stash or refashion something I already have. From there is has moved to, what else do I not have to buy? Simple things like dishcloths. Inspired by you, I thought of knitting, but have no wool. So instead of buying, I looked to my fabric stash, I discovered polar fleece fabric makes the perfect dishcloth. They wash in the machine really well and are very hardy. Six months of use and still going strong. Next on my list is to start making my own cleaning products. Great topic and very pertinent to me and my family at the moment. While we were both working, we bought solar panels, paid more down on our mortgage and did some needed repairs. I have also been making laundry liquid and sewing many of my own clothes for a while. I also joined Freecycle - not only to get necessities before the birth of our second child, but also so we could declutter what we had and not feel bad about it going to landfill. Now we are on to the next stage - the school aged children stage. We'd love to both give up work or at least work less, but we are trying to figure out if that means buying another investment property to give us income in the future (as with small children there are bound to be lots of expenses) or to just pay off our mortgage (which we aren't too far off). Do you have any thoughts on that? 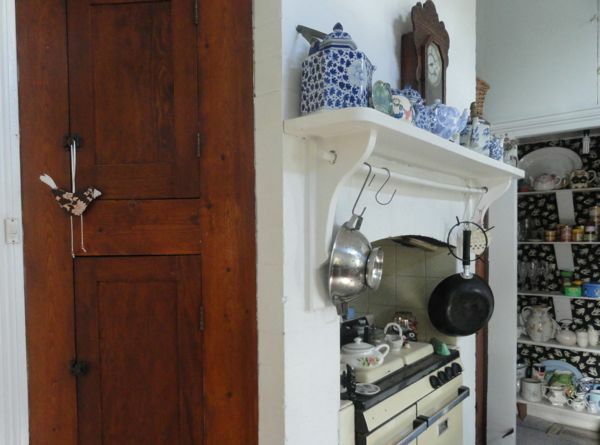 I love the photos of the kitchen and fuel stove.